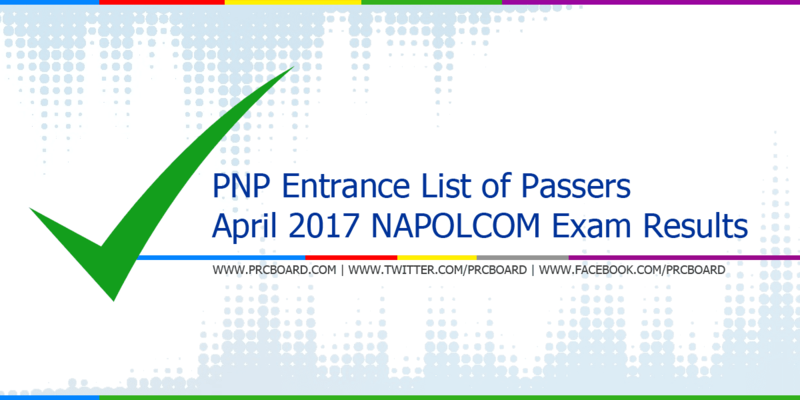 MANILA, Philippines - The PNP Entrance list of passers and related results in the April 2017 NAPOLCOM entrance and promotional exams are available at this website as the National Police Commission officially released the results online eight (8) weeks after the date of examination. Results of promotional examinations for other positions as well as top 20 examinees are also posted. Below is the complete list of passers for Philippine National Police (PNP) Entrance position in the aforementioned tests. 17-04-0207919, ZINGAPAN, JAYCRIS TUMALIUAN The entrance and promotional examinations are administered by NAPOLCOM on April 23, 2017 at various designated regional testing centers around the country. kailan kaya ang exact date ng result? kailan po ba ang exact date ng result? July 23 is three months. sa june 24 2017. lalabas ang result exam sa napolcom? Sana dali.an ang result para pag pumasa maka apply agad sa second cycle ngayon. wala pa po ba result sa exam ng april 23? kailang lalabas yng result ng napolcome? Cnong my reviewer ng pnu entrance exam? God bless us all! !sana kasali nami Sa list of passers..
Goodluck sa atin lahat!!! Sana makapasa ang mga nararapat, para makapag lingkod ng tunay sa BAYAN. lumabas na po ang result. Thank you NAPOLCOM, lalo na kay Lord God. Salamat nakapasa ako. goodpm. ask lg po ako kung paano kukuha ng certificates of results?